Ruffa Gutierrez's mysterious illness solved, thanks to ispiritista! Ruffa Gutierrez, beauty ambassador of Cosmo Skin, came to the press launch of Watsons' Big White Blowout earlier today, January 10, at The Podium, 18 ADB Avenue, Ortigas Center, Mandaluyong. Ruffa Gutierrez is hoping that career-wise, 2017 will be more productive. Aside from her family’s reality show It Takes Gutz to be a Gutierrez, which will air its season five this year, her "plan" is, "I’ll be back on TV, hopefully, and also with the movie, and other projects lined up din sa business. "Hindi na talaga puwede ngayong isa-isa lang, kailangan marami kang ginagawa, right? "So I’m very happy na tapos na yung 2016 because I also had health problems last year. 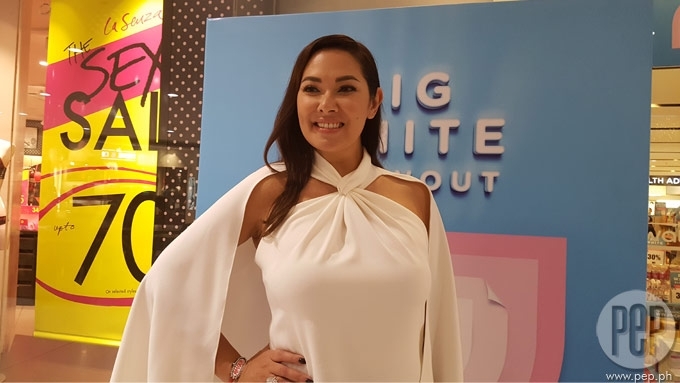 "So, hopefully, 2017 will be much, much better,” she told the press at the launch of Watsons’ Big White Blowout which entails big discounts on its whitening products until February 22. PEP.ph (Philippine Entertainment Portal) asked Ruffa to elaborate on her mysterious illness last year. It can be recalled that in July, she fainted twice. In both occasions, Ruffa then said, “I was doing things that I didn't know. "Parang I was acting in a strange way." Her mom Annabelle Rama even broke down because the second time she became unconscious, she had no pulse for five minutes. At the event held earlier, Ruffa gave more details that even she herself initially had a hard time believing. "Guys, sorry mga readers, huwag naman kayong mag-freak out, nag-freak out din ako…"
She related, "It always happens to me parang three a.m.
"Bakit hindi three p.m.? Bakit hindi two p.m.? Bakit every time when I’m sleeping, and it’s three a.m.? When she was rushed to St. Luke’s Medical Center by her brother Richard, that was when she started her series of check-ups. The doctors, however, couldn’t pinpoint her health problem. "Kahit anong klaseng medicine, kahit anong klaseng ospital ang puntahan ko, wala silang maghanap. "So it’s just, it’s just really na gano’n. "Pero lahat na ng ospital na pinuntahan ko, ilang hundreds of thousands na ang binayaran ko, wala silang maghanap." Her next option was to consult an ispiritista, whose 'diagnosis' was: "There [were] three of them following me around! "Totoo pala yun. Meron palang gano’n." Moving on with her story, Ruffa said, "And finally nahanap nila, and they shooed the spirits away. "Yes. Diyuskoday, ang dami nang ayaw magpa-feng shui ako at magpa-ispiritista, yung lang pala ang cure. "May mga sumusunud-sunod sa akin na mga ispiritu day, nakakaloka." Since then, no more spells at 3 a.m., and "…I’m just really happy na nawala na ‘yon. "Kaya now, I’m super fine, healthy."